Allington had a vast number of rooms. Isabella Maria d'Este arrived at the Allington Castle. She was to meet the King of England. A carriage arrived at the castle. She looks out the window. I was at Allington Castle awaiting the arrival of the Duchess of Ferrara. 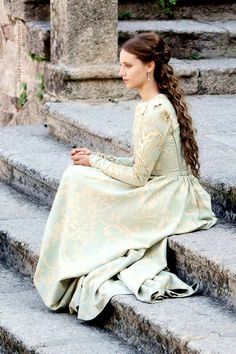 It was around midday when i was standing at the entrance to the castle as a carriage pulled up outside and I approached it and offered the Duchess my hand. "May i help you down my lady? She took his hand and climbed out. She looks around and curtsy low to him. "Your Majesty. "She said softly. Duchess Isabella may i welcome you to England and to Allington Castle. She walked into the castle with the king. Started to wonder why met here. "Thank you your majesty. "She said softly to him with her hood still up. I lead her into the great hall. Forgive us having to meet here my lady i was meeting a certain courtier not far from here. We shall return to London tomorrow. I trust you had a safe journey? "Are we alone here and yes? "She asked him. She blushes at the thought. "Shall we go to the bedchambers my dear?